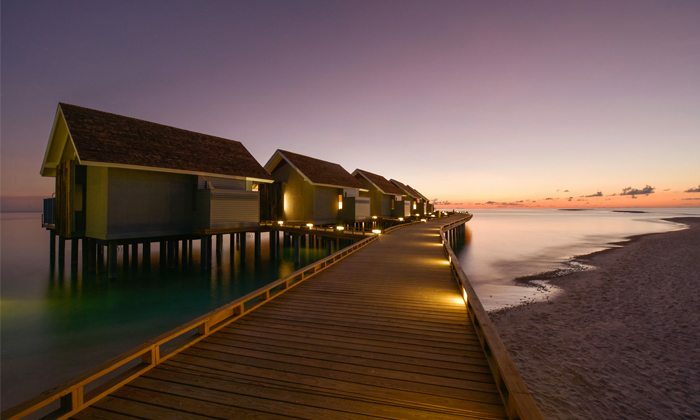 290 beach and water villas are dotted around this peaceful atoll. 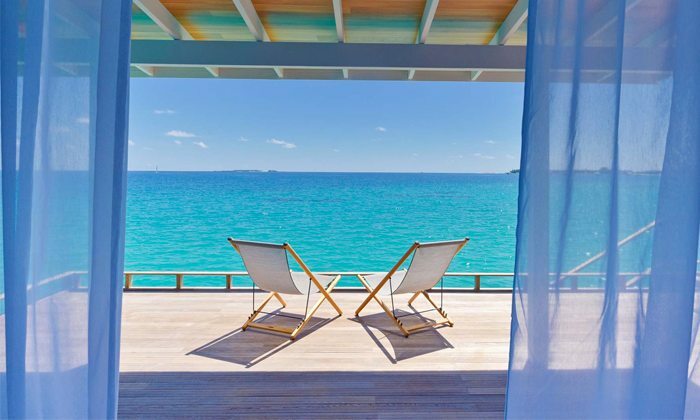 Whether you choose to step out onto the lush white sand, or immerse yourself into the Indian Ocean from your private over-water deck; this unique island retreat will please. 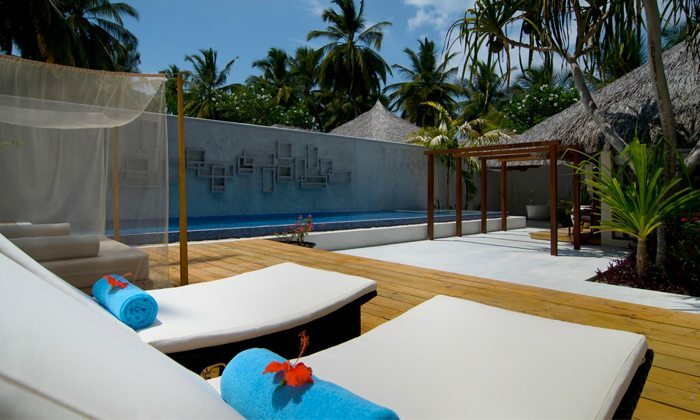 Located on the white sandy beach, these spacious villas offer 48 square meters of vibrant living space. 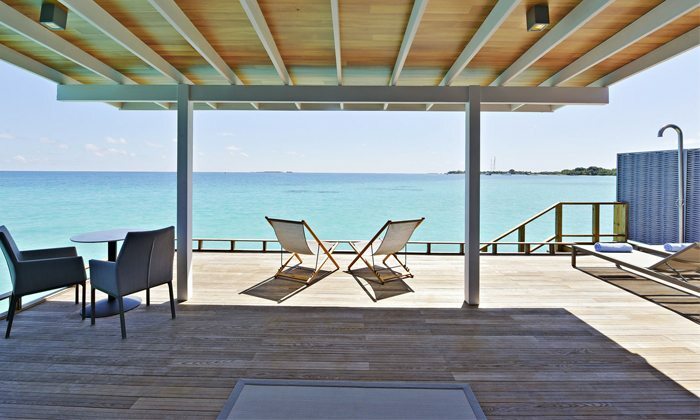 Enjoy direct beach access from your private outdoor area with veranda and daybed where you can adore the exquisite lagoon views. 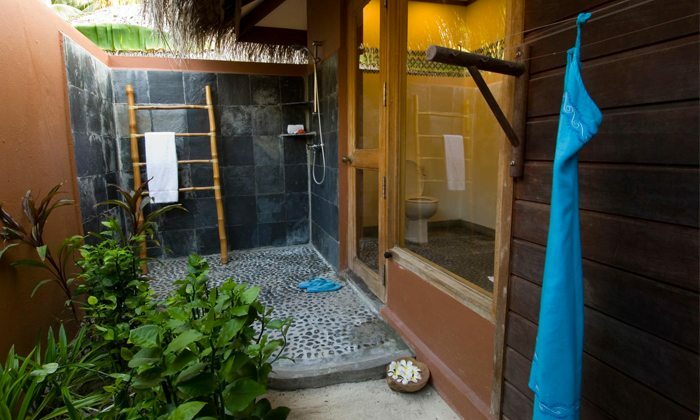 Stay refreshed with the open-air bathroom feature, keeping you cool while you bathe. 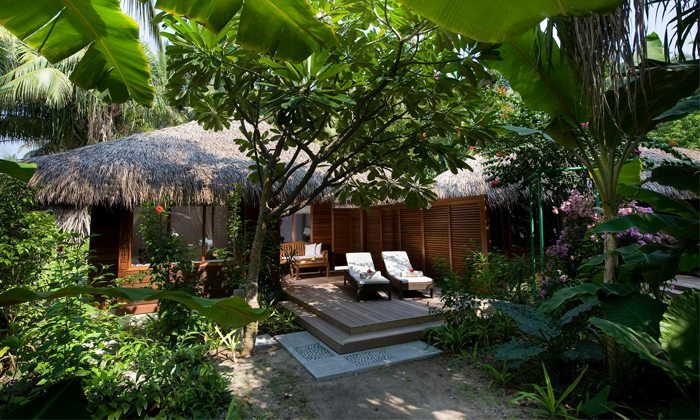 IDD Telephone, Coffee/Tea Making Facilities, Flat Screen TV with Cable, DVD Player, iPod Docking Station, Wi-Fi Internet, Wooden Deck and Sunloungers. 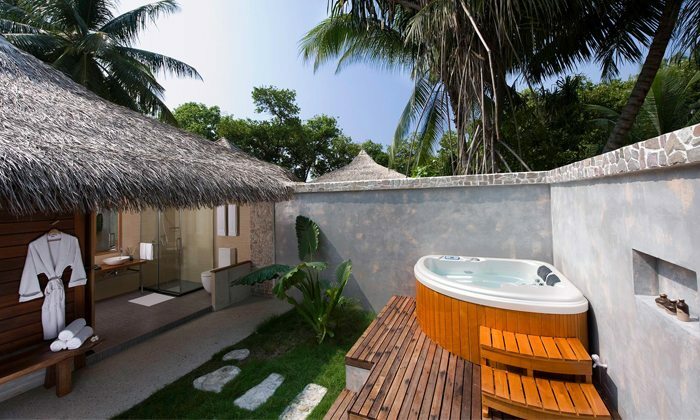 Located amongst Kuramathi’s beautiful natural gardens the 33 Beach Villas with whirlpool feature a spacious living area and a tempting outdoor Jacuzzi. 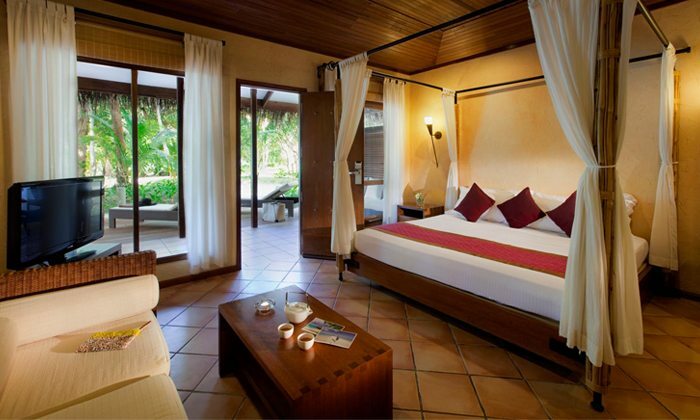 Inside each of the wonderful villas you’ll find a king-sized four-poster bed along with a large open-air bathroom. 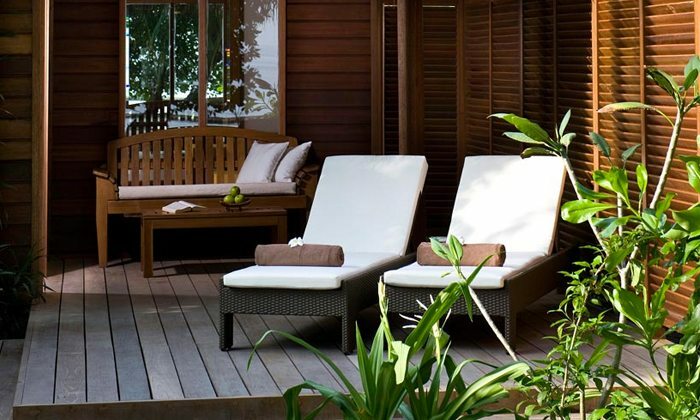 The outdoor deck offers a perfect place to soak up the sun from its outdoor daybed, sunloungers and inviting whirlpool. 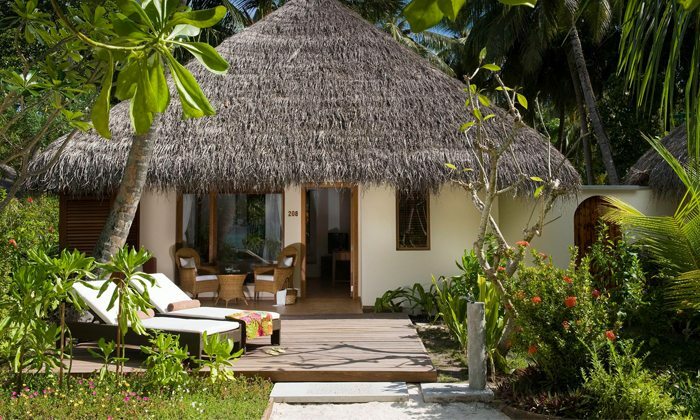 The alluring 35 Superior Beach Villas are designed in a modern style and are round in shape. 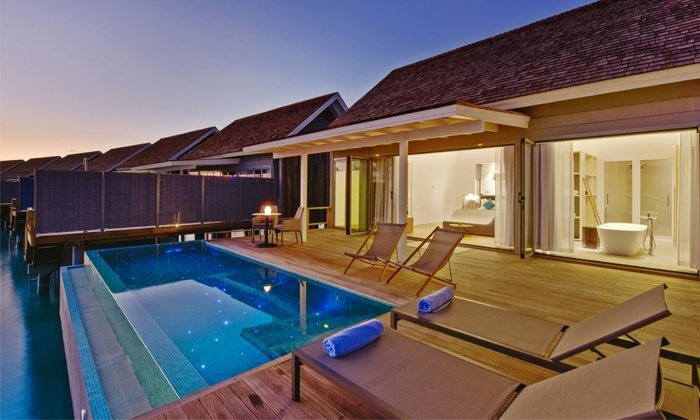 These striking villas feature a wooden outdoor deck with a built-in daybed and sunloungers. 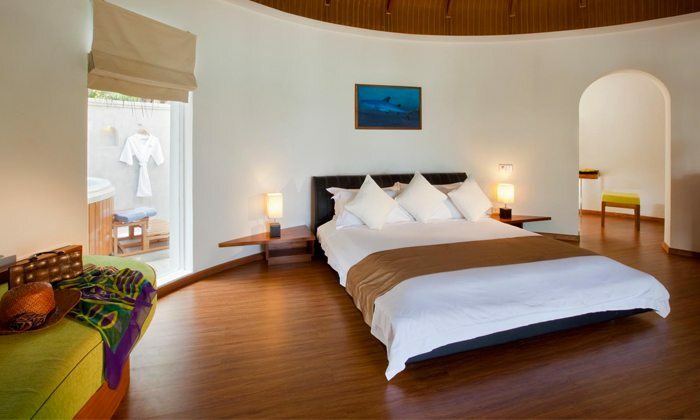 The airy bedrooms have a king-sized bed with the open bathroom leading straight out to the whirlpool and deck. 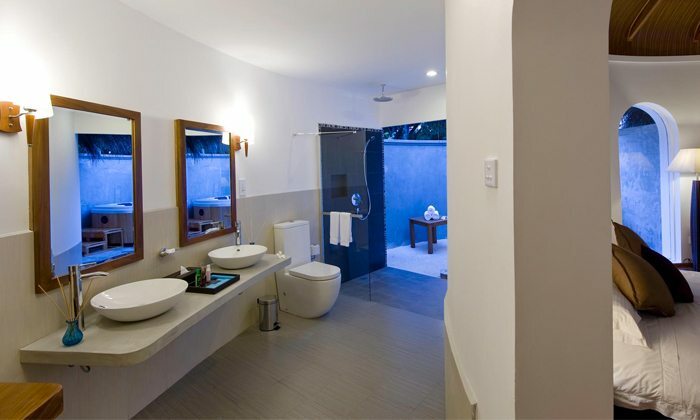 Bathrobes, Bathroom Amenities, Minibar, In-Room Safe, IDD Telephone, Coffee/Tea Making Facilities, Flat Screen TV with Cable, DVD Player, iPod Docking Station, Wi-Fi Internet, Wooden Deck, Outdoor Daybed and Sun loungers. 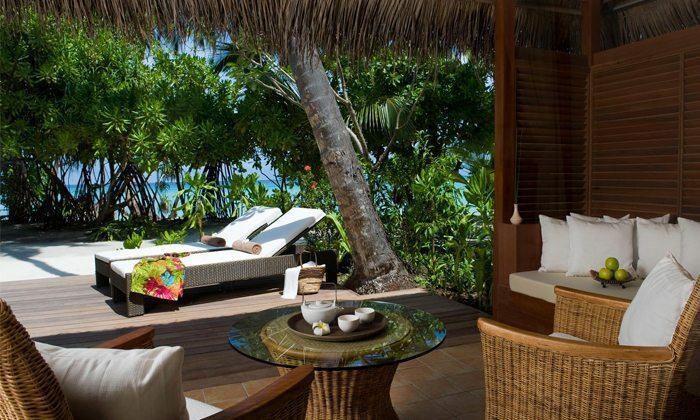 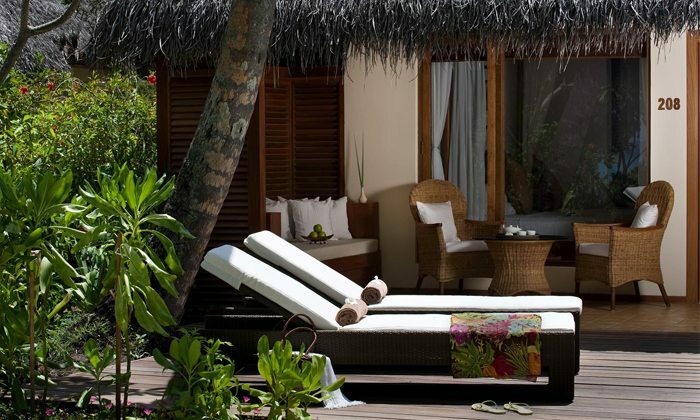 Adjacent to the turquoise lagoon, the 31 luxurious deluxe beach villas are the height of decadence. 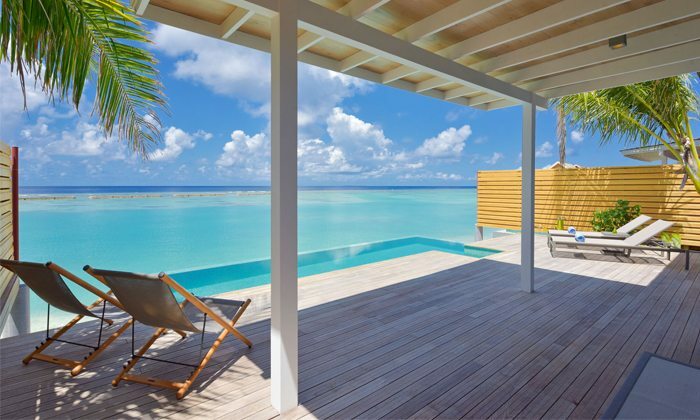 This beautiful villa features an oversized outdoor wooden decks sunloungers and a daybed next to the raised whirlpool. 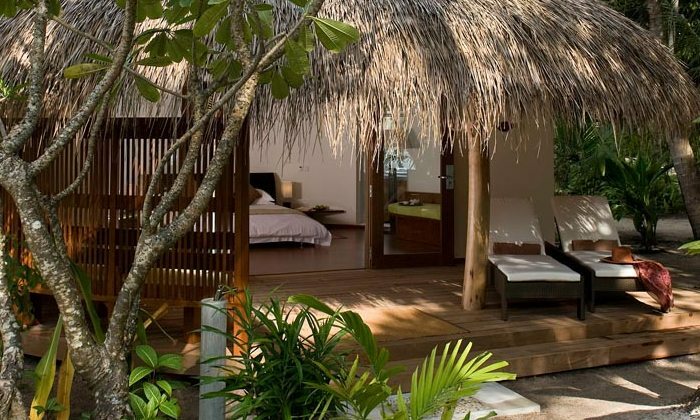 The bedroom has a king-sized four-poster bed along with a bathroom with bath and shower, twin vanities, outdoor rainfall shower and an espresso machine. 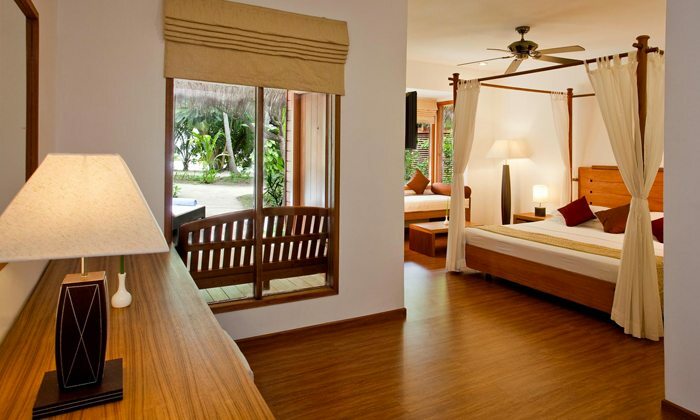 King-Sized Four-Poster Bed, Indoor Daybed, Open Air Bathroom, Rainfall Shower, Outdoor Rainfall, Shower, whirlpool, Twin Vanities, Hot & Cold Water, Fan, Air Conditioning, Hair Dryer, Bath & Beach Towels, Bathrobes, Bathroom Amenities, Minibar, In-Room Safe, IDD Telephone, Coffee/Tea Making, Facilities, Flat Screen TV with Cable, DVD Player, iPod Docking Station, Wi-Fi Internet, Wooden Deck and Sunloungers. 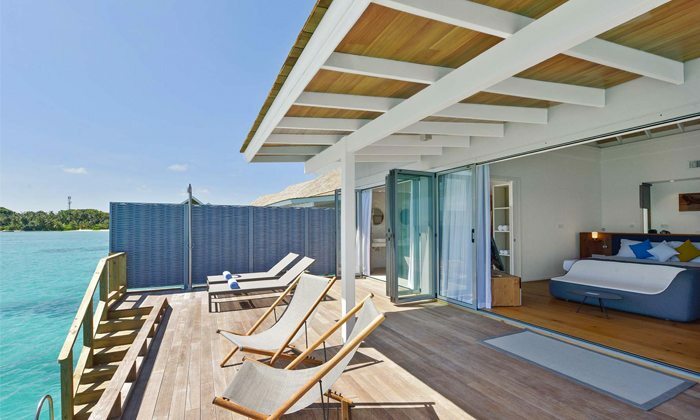 Two-bedroom beach houses are spread out on two storeys of opulent living, each with their own living space and bathrooms which feature an outdoors rainfall shower, bath and separate indoor shower. 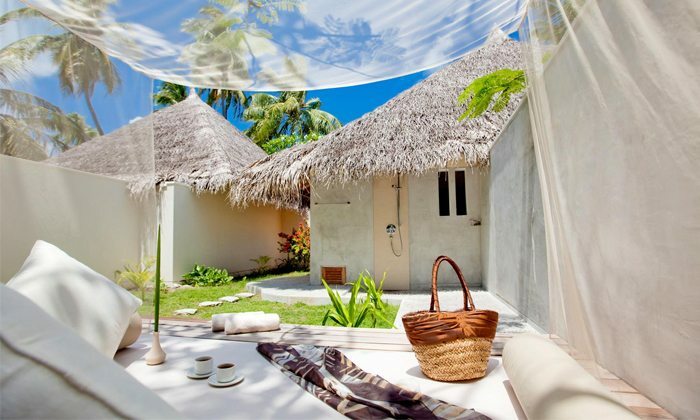 The Two-Bedroom Beach Houses can occupy up to 6 adults or 4 adults and 2 children. 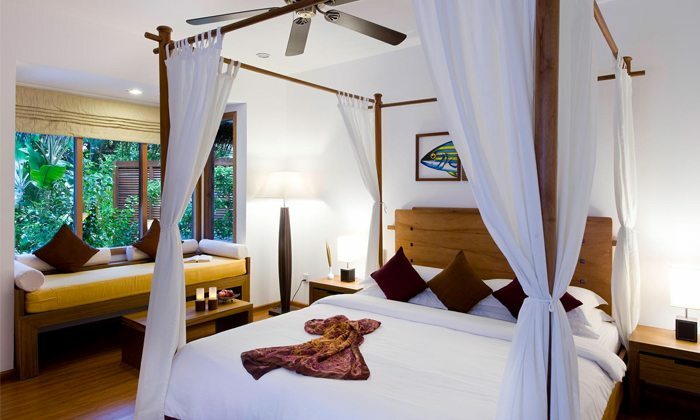 King-Sized Four-Poster Bed, Semi-Open Air Bathroom, Rainfall Shower, Hot & Cold Water, Fan, Air Conditioning. 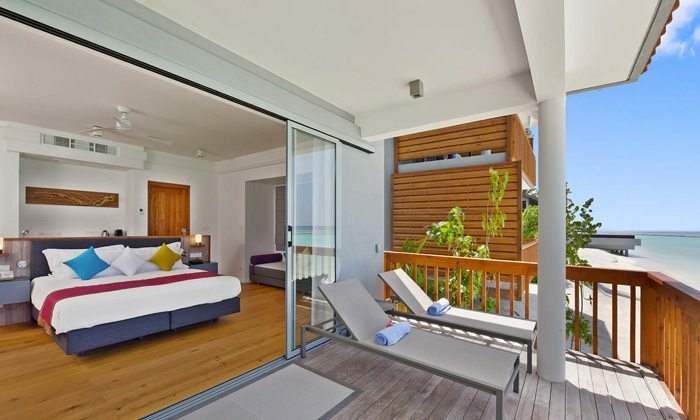 Hair Dryer, Bath & Beach Towels, Bathrobes, Bathroom Amenities, Minibar, In-Room, Safe, IDD Telephone, Coffee/Tea Making Facilities, Flat Screen TV with Cable, DVD Player, iPod Docking Station, Wi-Fi Internet and Sun loungers. 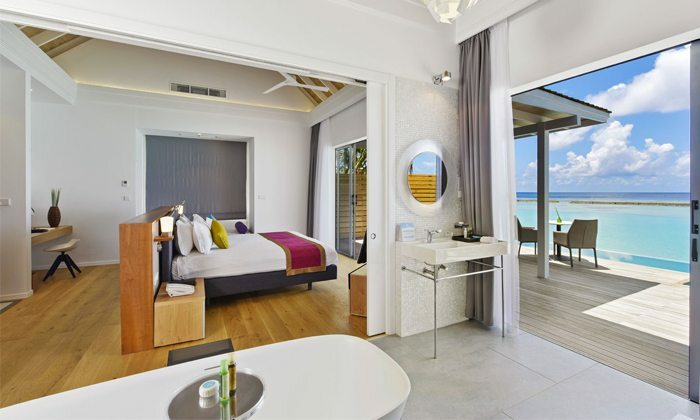 Raised above the turquoise waters of the Indian Ocean on stilts, each of Kuramathi Island Resort’s 50 water villas feature an oversized two-tiered sundeck with sunloungers and a whirlpool. 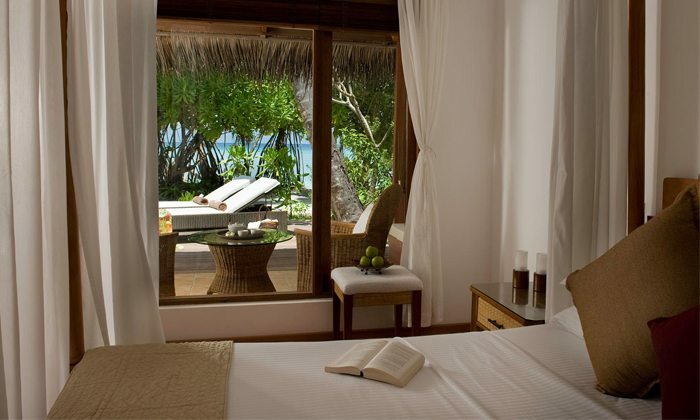 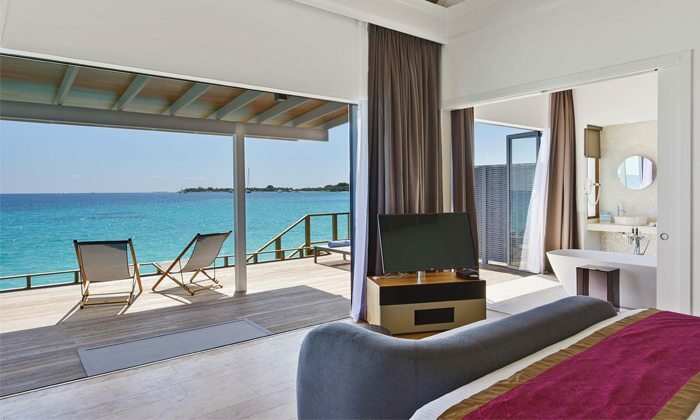 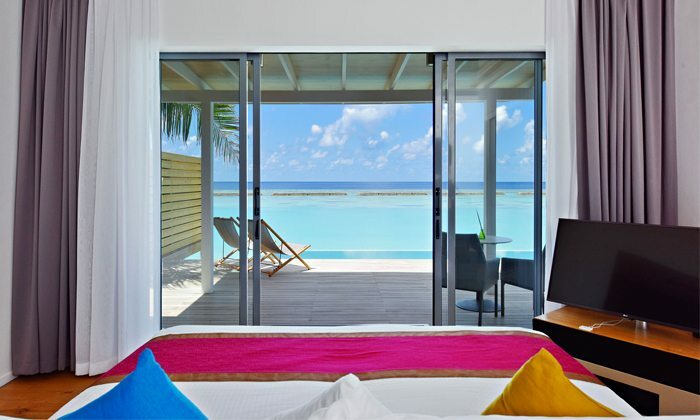 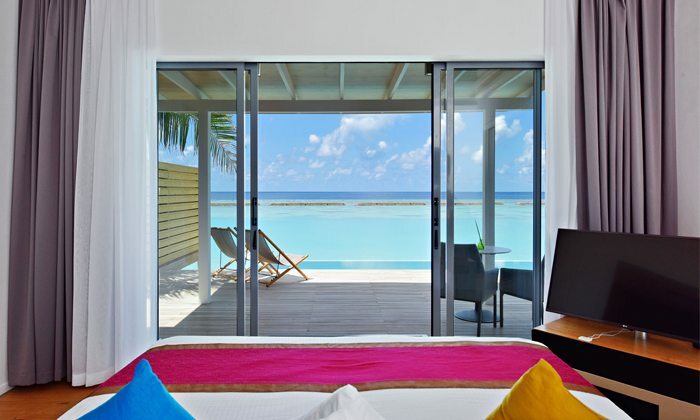 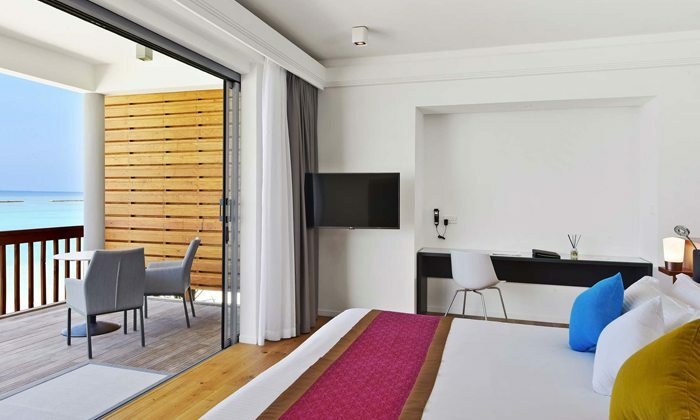 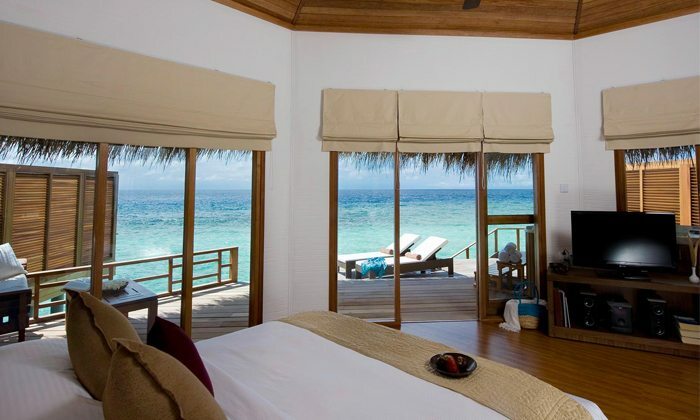 Savour the outstanding panoramic views of the Indian Ocean that are provided by the villas airy king-sized bedroom. 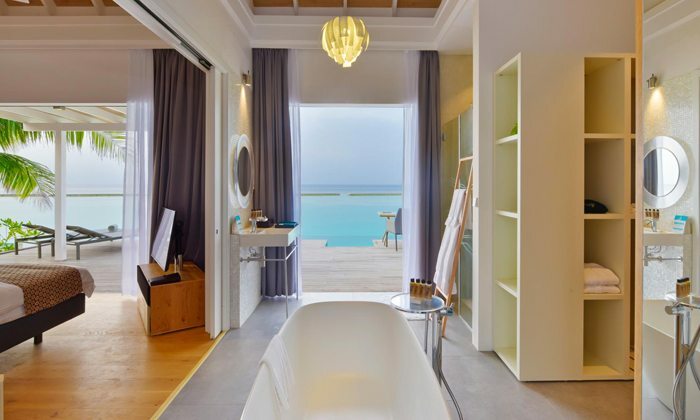 The water villas also feature a spacious bathroom with twin vanities and rainfall shower. 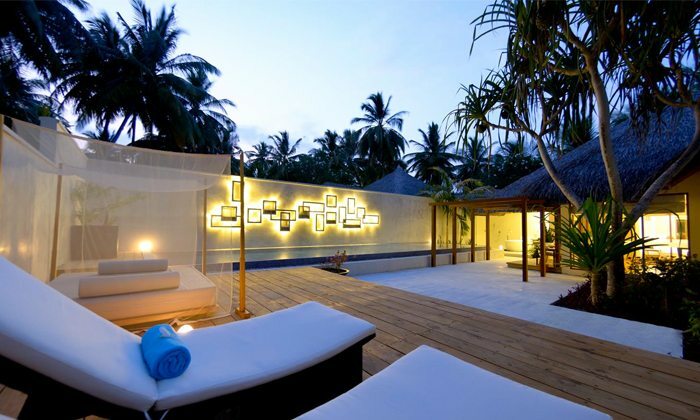 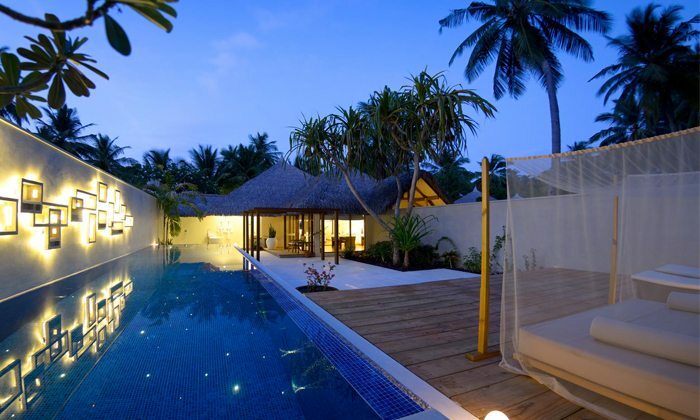 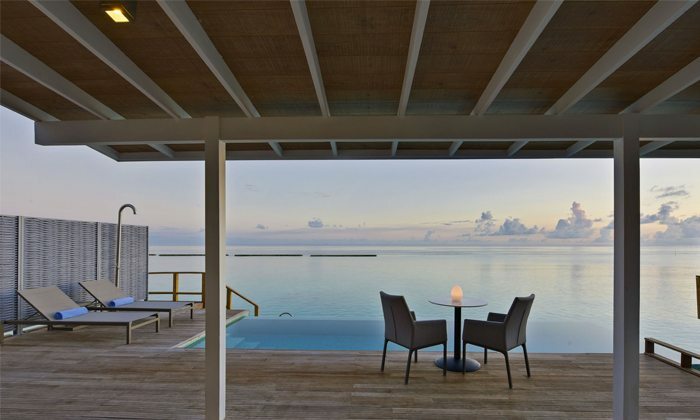 These villas truly are the perfect place to enjoy Kuramathi from. 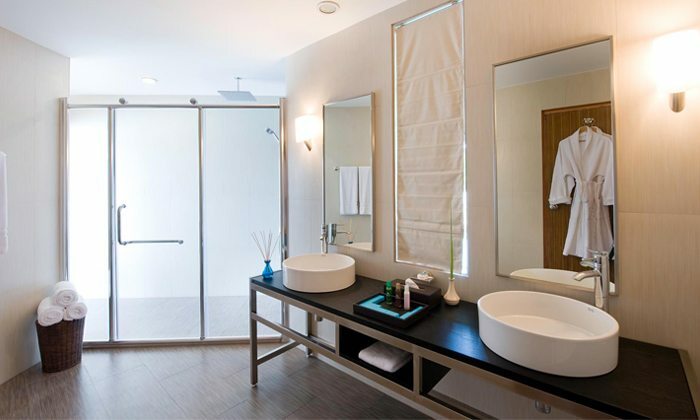 King-Sized Bed, Indoor Daybed, Semi-Open Air Bathroom, Rainfall Shower, whirlpool, Twin Vanities, Shaving/Make Up Mirror, Hot & Cold Water, Fan, Air Conditioning, Hair Dryer, Bath & Beach Towels, Bathrobes, Bathroom Amenities, Minibar, In-Room Safe, IDD Telephone, Espresso Machine, Flat Screen TV with Cable, DVD Player, iPod Docking Station, Wi-Fi Internet, Split-level decks, Sun Umbrella and Sunloungers. 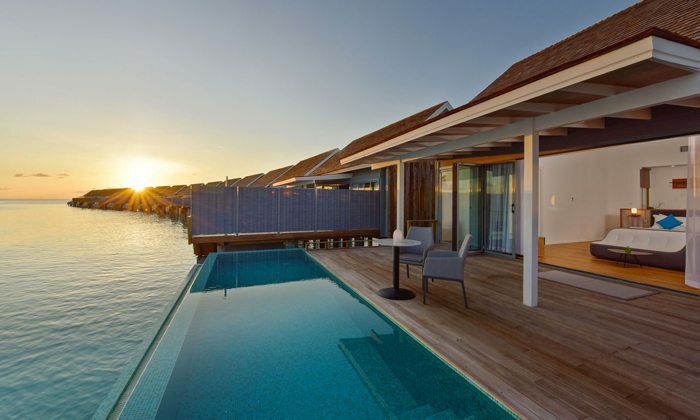 With spectacular views of the crystal waters that surround Kuramathi Island all the 20 water villas are situated on stilts directly over the lagoon. 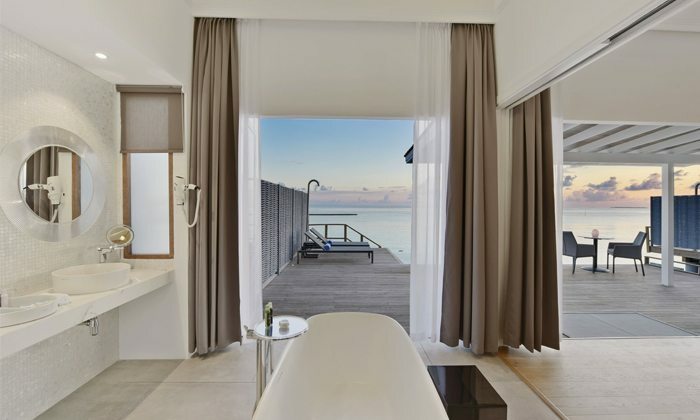 These fantastic water villas feature chic amenities and bathrooms that boast vanity sinks and rainfall showers but what this villa is all about is spending time on the deck that overlooks the aquamarine lagoon. 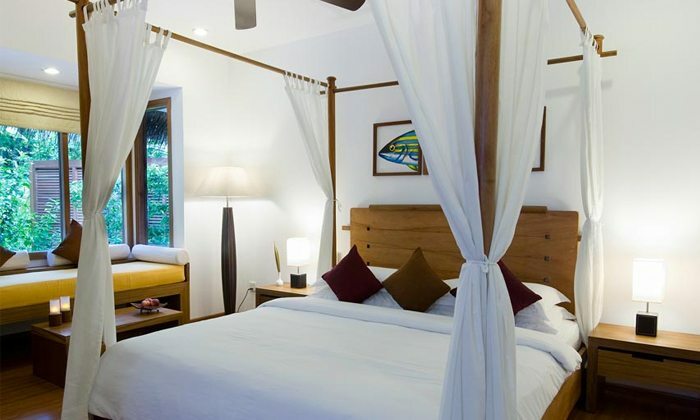 King-Sized Four-Poster Bed, Semi-Open Air Bathroom, Rainfall Shower, Twin Vanities, Hot & Cold Water, Fan, Air Conditioning, Hair Dryer, Bath & Beach Towels, Bathrobes, Bathroom Amenities, Minibar, Espresso machine, In-Room Safe, IDD Telephone, Flat Screen TV with Cable, DVD Player, iPod Docking Station, Wi-Fi Internet, Wooden Deck and Sunloungers. 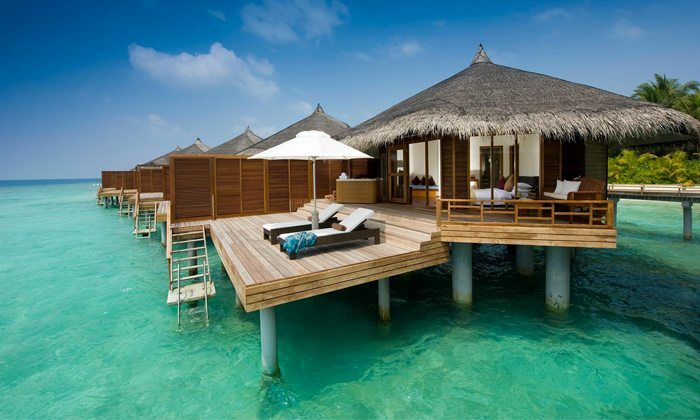 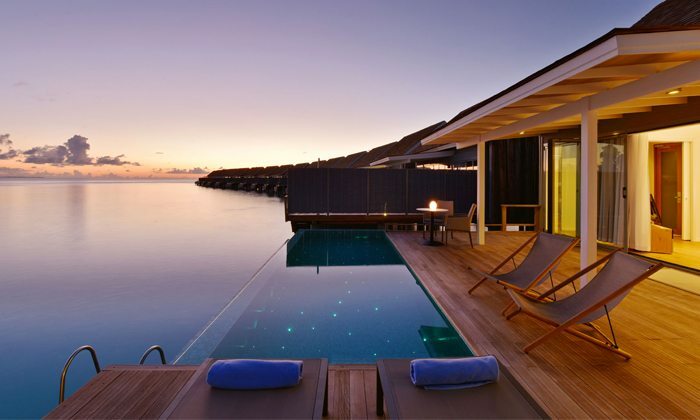 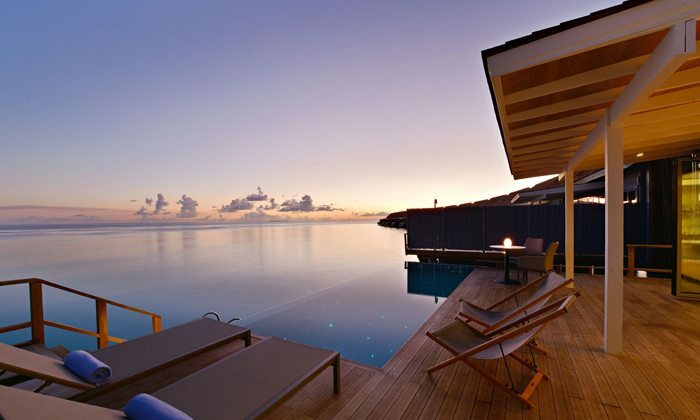 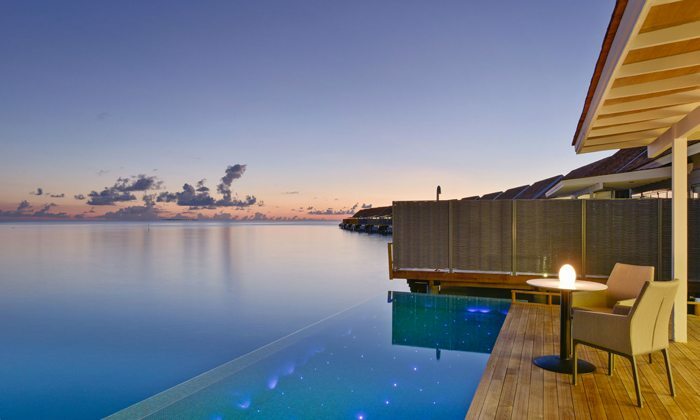 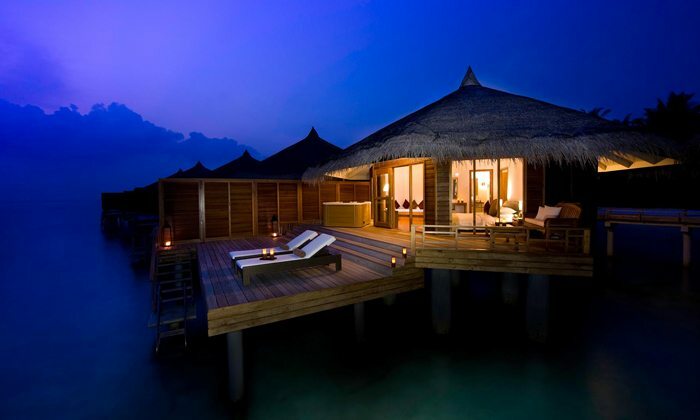 The Water Villas with Pools are located on either side of this island, either facing the lagoon or the house reef. 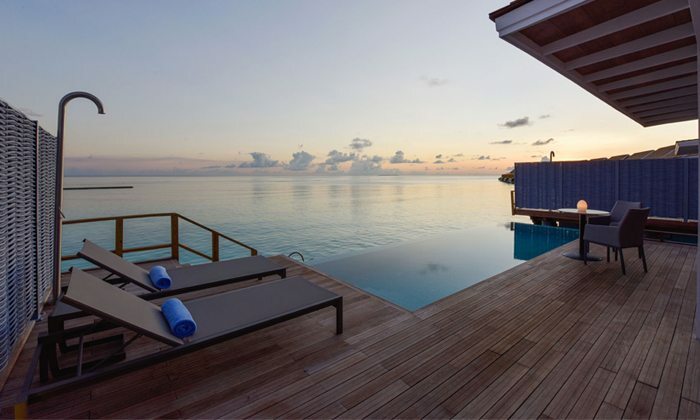 Featuring a private pool on the deck, you can enjoy uninterrupted Ocean views as you enjoy your tranquil Maldives holiday. 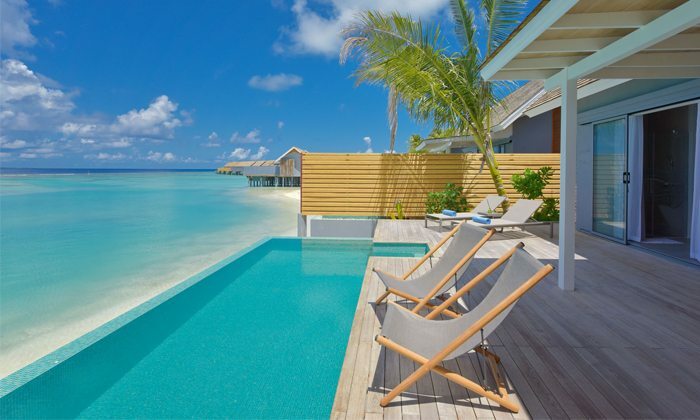 All the Water Villas with Pool include: an 18 sqm private pool, king size bed, rainfall shower, free standing bath, twin vanities,, hot and cold water, fan, air conditioining, hair dryer, bath and beach towels, bathrobes, bathroom amenities, minibar, wine cellar, in-room safe, IDD telephone, espresso machine, flat screen TV with cable and lightning dock, Wi-Fi, wooden deck, sun loungers, deck chairs, dining table, rechargeable torch, life jackets, iron and ironing board and bathroom scale. 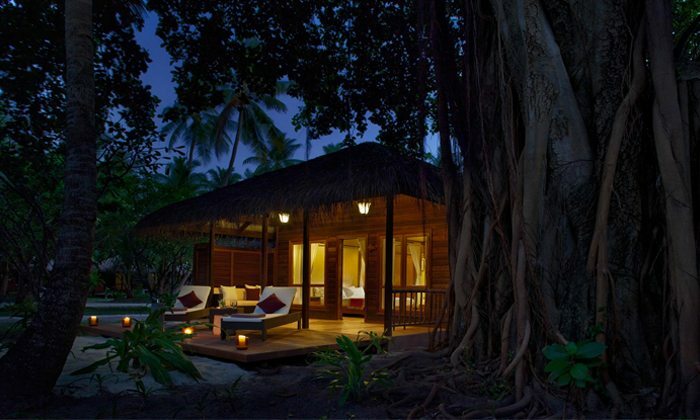 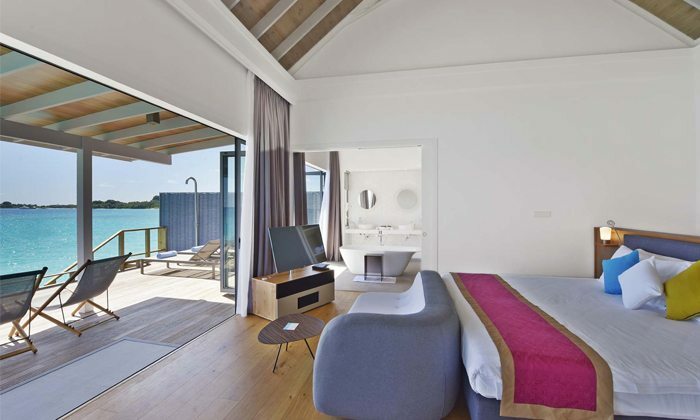 Positioned on the edge of the beach, the Pool Villa is a tranquil oasis with uninterrupted views of the Indian Ocean. 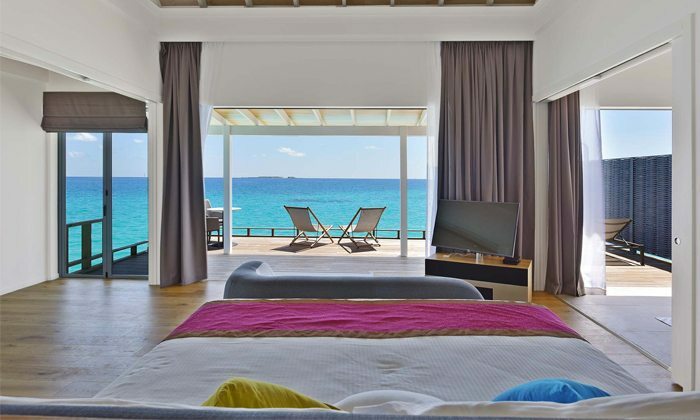 From the king sized bed you can really appreciate the stunning morning views of the pool and ocean as the morning light seeps in through the large windows. 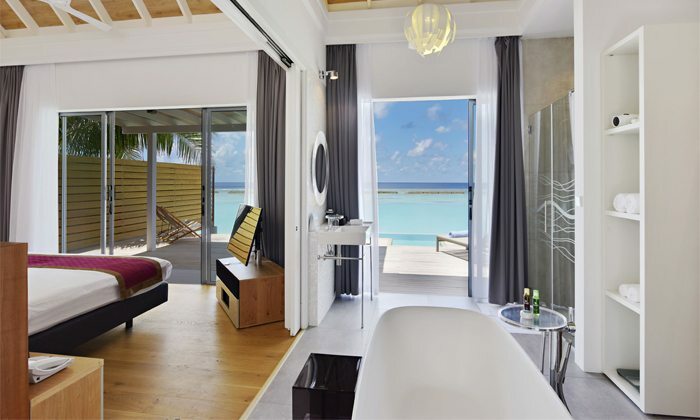 The Pool Villa is complete with walk-in wardrobe, indoor bathroom with freestanding bath and a separate outdoor rainfall shower. 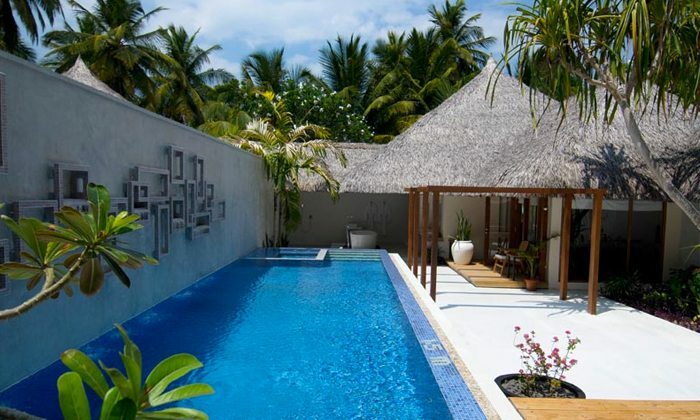 All the Pool Villas include: a private pool measuring 18 sqm, king size bed, rainfall shower, free standing bath, twin vanities, hot and cold water, fan, air conditioning, hair dryer, bath and beach towels, bathrobes, bathroom amenities, mini bar, wine chiller, in-room safe, IDD telephone, espresso machine, flat screen TV with cable, Wi-Fi, wooden deck, sun loungers, deck chairs, dining table, rechargeable torch, life jackets, iron and ironing board and bathroom scales. 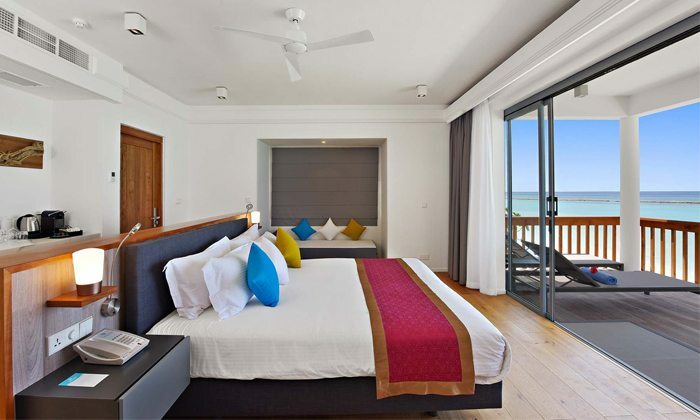 Similar to the Water Villas with Pool, you can expect a much more sublime location near the iconic sandbank that makes Kuramathi one of the most beloved islands. 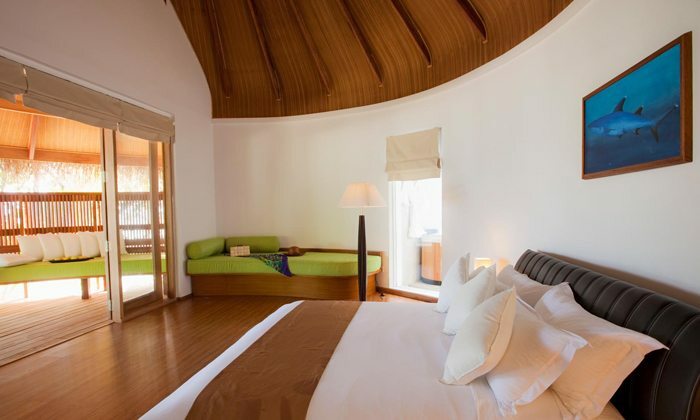 All the Thundi Water Villas with Pool include: an 18 sqm private pool, king size bed, rainfall shower, free standing bath, twin vanities, hot and cold water, fan, air conditioning, hair dryer, bath and beach towels, bathrobes, bathroom amenities, mini bar, wine chiller, in-room safe, IDD telephone, espresso machine, flat screen TV with cable and lightning dock, Wi-Fi, wooden deck, sun loungers, deck chairs, dining table, rechargeable torch, life jackets, iron and ironing board and bathroom scales. 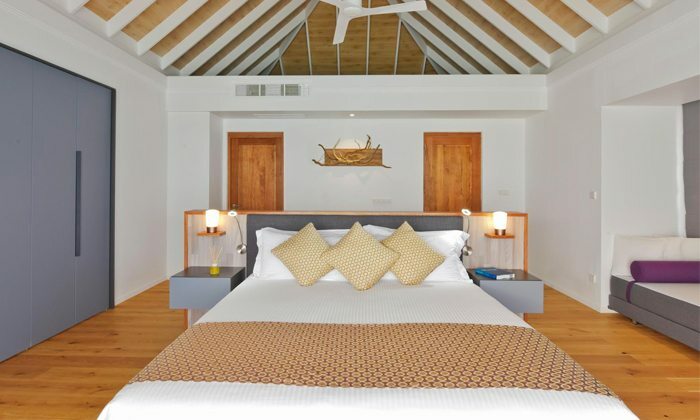 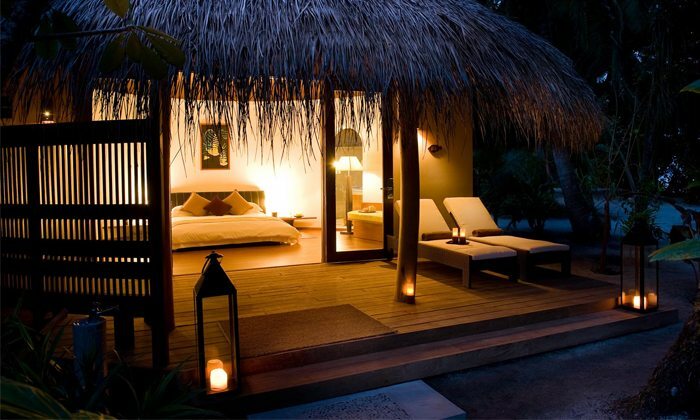 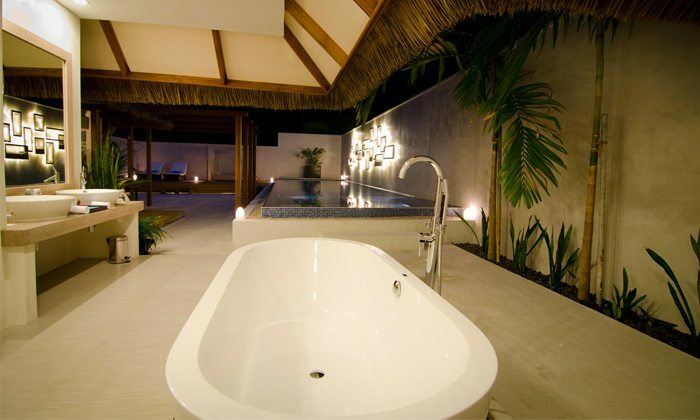 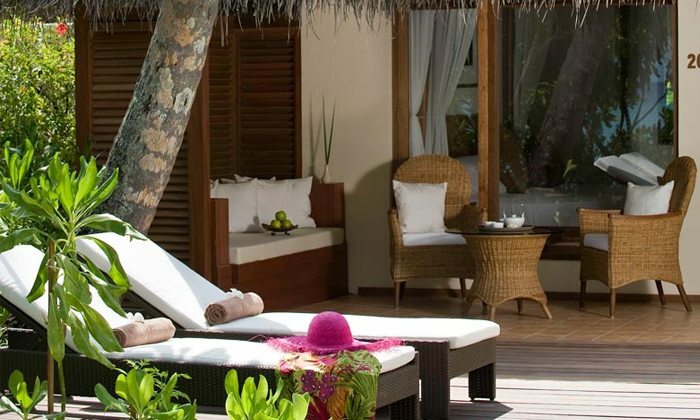 Kuramathi’s two Honeymoon Pool Villas are designed to ensure married couples begin their life as man and wife in bliss. 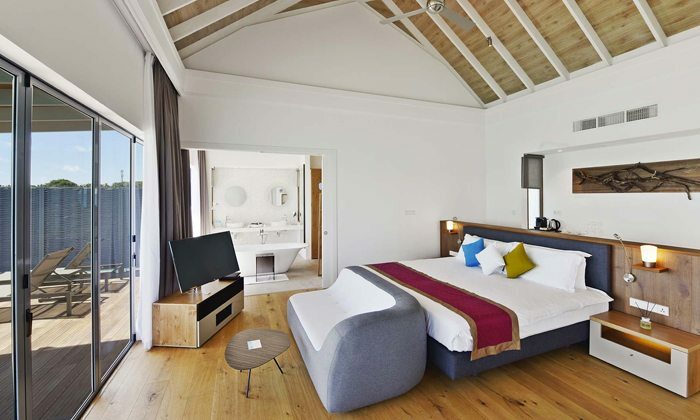 The large one bedroom villas have a separate spacious living area. 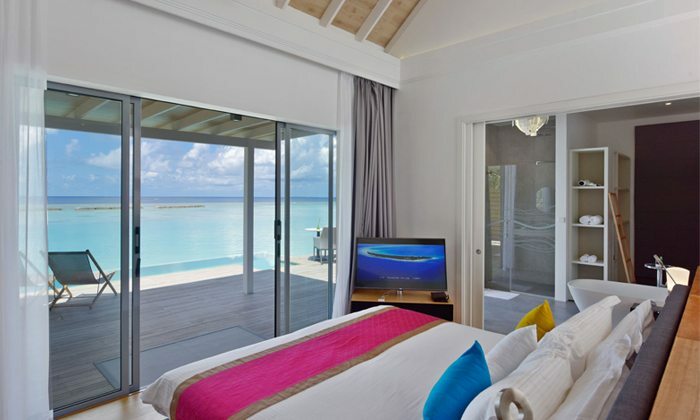 The bedroom has a vast king-sized along with a daybed. 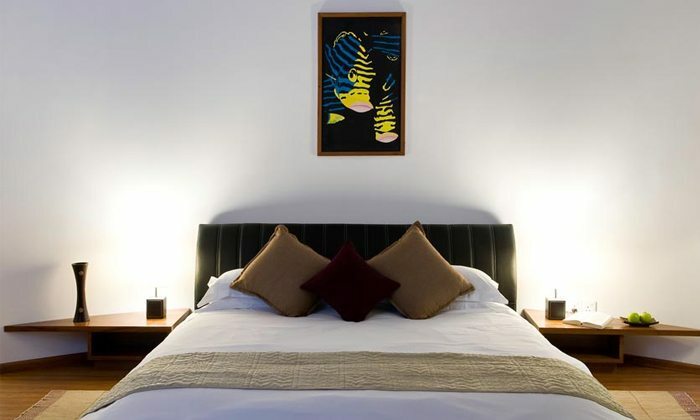 The separate living room has a comfy sofa along with a large flat-screen television with DVD player and an espresso machine. 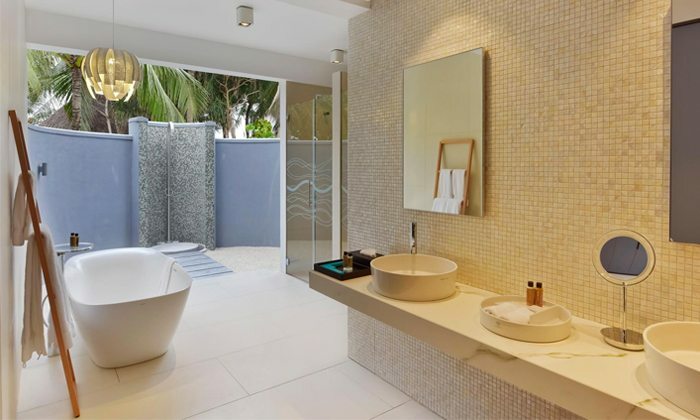 The private terrace area features an open-air bathroom with twin vanities, large LED lit shower, a bath for two and an air-conditioned dining area. 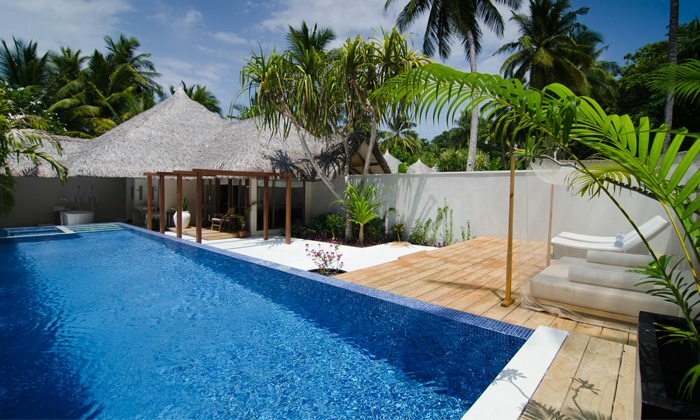 This romantic villa is completed by its heavenly 10 metre lap pool. 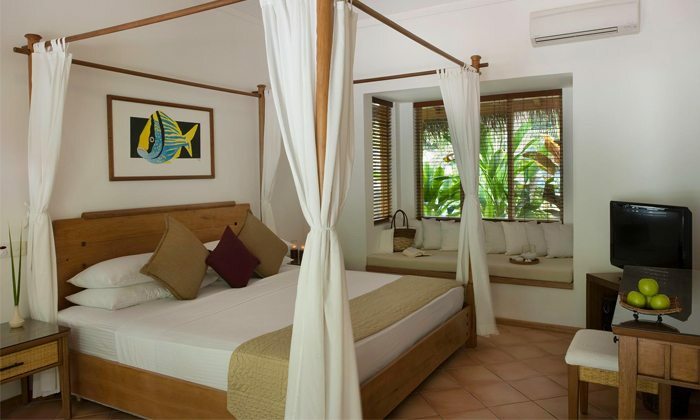 King-Sized Four-Poster Bed, Separate Living Area, LED lit open shower, Bath with shower, 10 Metre Lap Pool, Jacuzzi, Twin Vanities, Hot & Cold Water, Fan, Air Conditioning, Hair Dryer, Bath & Beach Towels, Bathrobes, L’Occitane Amenities, Minibar, In-Room Safe, IDD Telephone, Private Dining Area , Espresso Machine, Flat Screen TV with Cable, DVD Player, iPod Docking Station, Stereo System, Wi-Fi Internet, Wooden Deck and Sunloungers.